After being in the construction industry for most of my working life, I’ve learned the hard way that weight restrictions for ladders really do apply. Over the years I have used many ladders for all occasions. Some are better than others which is why I have called upon my experience to show you what I believe are to be the best Step Ladders For Heavy People. To try and help anyone who’s looking to buy a heavy duty step ladder to handle larger weight capacities and not fall for an inferior ladder. So I’m a bit fat and even a little overweight you might say. But when it’s time for work or even home use, my weight cannot stand in my way. On a week to week basis, I’ve needed various ladders to cater to my weight capacity. Many of the standard ladders available cannot handle the power of a big man at work like myself. So I had to seek alternatives. Which I’m about to share with you here. The 2 common ladders I’ve used are 4 foot and 6 foot ladders. Along with the ever handy 2 step ladder and working platform stool. The not so common attribute is how much weight they withstand. These heavy duty ladders are tough enough to handle claimed weights from 300 lbs to 500 lbs. Hopefully you can learn from my cheapened ways (Meaning I use to just buy the cheapest ladder in town) and save yourself the embarrassment and find your perfect oversized ladder from the get go. Trust me, its a much less painful route. 4 Looking For A Sturdy Step Stool? Dewalt products are known as industry leaders all over the world. This 4 foot 375 pound capacity step ladder is no different. It’s an amazingly sturdy and strong little ladder. Which is what us big guys need. However I believe this ladder would suit the worker more so then for rare home use. So if your only looking for a heavy duty home use step ladder, I suggest you keep reading to find a cheaper option. But if your in any industry that requires a lot of ladder use, then this Dewalt ladder is the right product for you. The 6 foot ladder version by Dewalt is also highly recommended for those higher reach areas. Good choice step ladder for heavier people - The wide steps and the strength of this ladder are ideal. I love the magnetic top plate and sections to hook tools into. A really good ladder that can get you where you want to be. My favourable recommendation. I don’t know about you, but when standing on the top step of any ladder no matter what size it is, the nervous wobbles always kick in. Which is why I love this 4 foot step ladder by the Little Giant Ladder Systems. When your standing on the top platform which is about 12″ by 12′ you feel rather safe. Which is even more crucial for us bigger folks. The extension which comes out the top of the ladder is a great stabilizer for when you start to get the wobbles. It’s also a mental thing. Because many times on the job I’ve felt super comfortable at heights as long as there is a wall or something close by. But as soon as you’re in open space with nothing to potentially grab onto, the feet become like 200 pound weights and simply cannot move. It’s a horrible experience and don’t wish it upon anyone. Besides the confidence and stability this heavy duty step ladder can give, I just love how easy it is to ‘hide’ or fold away out of sight. It packs away ever so easily and weighs just under 10 Lbs. Heavy duty, lightweight, stable and affordable. It’s my best recommendation for anyone that’s a bit nervous on ladders. The top safety rail gives that extra security feature and confidence to step up to the top platform. Which also has slots in it so you can rest your knees or legs in them for even more stability. I also like the fact the top rail has handles you can grab onto. This ladder offers me much support and sturdiness. It’s easy to pack away after use, but is not as slim as the little giant system and is a little heavier. Not much more at 17.5 lbs. Still I find this ladder a good choice household step ladder for heavier people up to 300 Lbs. 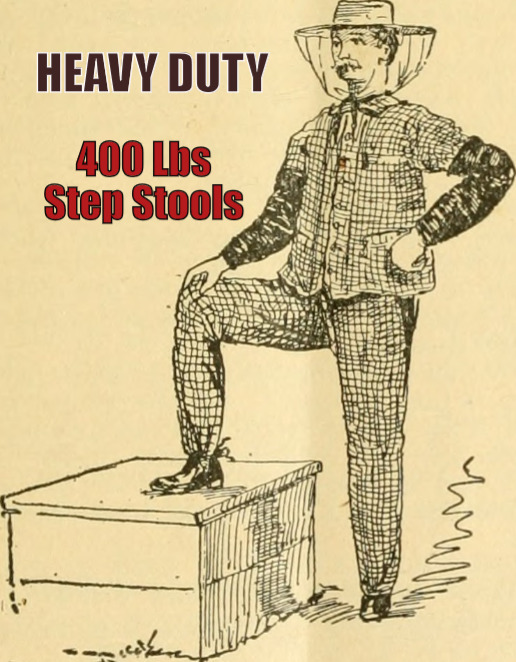 Looking For A Sturdy Step Stool? Is it a step ladder or is it a sitting stool?. Who cares, all I know is that this little thing is such an amazing investment. 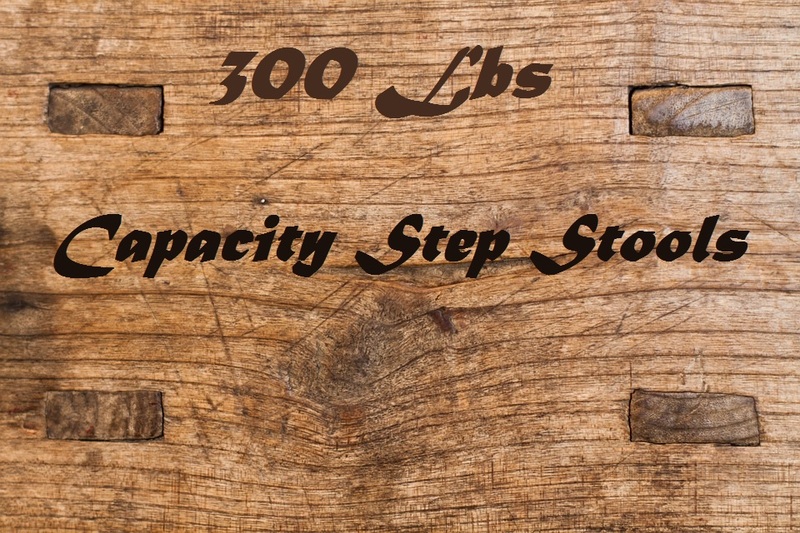 It’s rated to hold an impressive 350 pounds. It literally feels like your standing on a concrete platform. That’s how solid and sturdy this step stool is to me. Best of all it has a nice carry handle and folds up into a compact unit. So you can take it almost anywhere and also use it as a back up seat. No matter which heavy duty ladder you end up buying, it’s of extreme importance that you follow safe practices. A ladder can be a very dangerous object if handled incorrectly. Here’s a quick video on the importance of safety when using a step ladder. I hope it serves you well Jennifer. I must admit I’m a big fan of the magnets on the side as I’m forever dropping screws etc, so it comes in handy a lot. Have you reviewed any ladders that are 12 feet plus? That is what I am looking for- I was hoping for a Little Giant or something similar that would collapse. I bought a ladder, but it does not go. Please can you tell me how to make the ladder go? It works fine for skinny people, but I’m a bigger boy and it does not go. Thank you. Hi Cross, can you explain in more detail what you mean by ‘the ladder does not go’?. I am a larger Man myself and have used ladders for a long time. So maybe I can help.